Home > Accessibility > What are the Most Important Things to Consider when Choosing a School for my Child? Starting school is one of the biggest events in both a family member’s and a child’s life. All benefit from advice and support when starting a new school. There is so much information out there that it can overwhelming sometimes just to know where to start. In Ireland, we have much to celebrate about the high-quality of our primary education system, which is recognised worldwide and the envy of many countries globally. Entry to the teaching profession is closely regulated, ensuring that the calibre of our teachers is world class. We have a child-centred curriculum that focuses on enabling each child to reach his/her potential across multiple areas, allowing your child to develop his/her unique talents, strengths and interests. We have made incredible progress towards creating an inclusive education system, that welcomes children with diverse abilities. In recent years, there has been a focus on ensuring that all teachers have an awareness and understanding of what it means to have a child with autism in the class and the range of effective approaches that have been developed to meet your child’s needs. When selecting a school for your child, remember firstly that you know your own child best, and therefore you will know best the school where your child can thrive, flourish and most importantly be happy. The Area Based Childhood (ABC) Start Right Project in Limerick convened an inter-agency group to work on a publication aimed at providing advice for parents and families; early childhood settings and primary schools to support all children in transitioning from an early childhood setting to primary school. As you can see from the cover below, there was a wide range of experts in education involved in this publication. 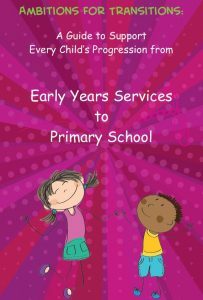 Ambitions for Transitions and a range of other transition resources to help you support your child, and yourself during the transition to primary school are available to download free at (ABC) Start Right Project’s ‘Love Parenting’ website here. Consulting with your child, about going to school and listen to his/her views about what the best school in the world might look like to him/her. You can even ask your child to draw or make with bricks/lego/plasticine what the best school might look like and chat with him/her about it. If your child communicates differently, for example through gestures, pointing and/or eye-movement, then you can observe activities and situations, your child is happiest being involved in, and feels most confident and secure. When selecting the school for your child, you can keep in mind what your child has communicated to you, and what you have observed so that the school you select suits your child. Very often, as adults, we forget to take note of what children are thinking despite all of the research telling us that very young children and children with autism have lots of opinions about what they like and what they don’t like. Communicating with children helps us as adults to understand the world from our children’s perspective. 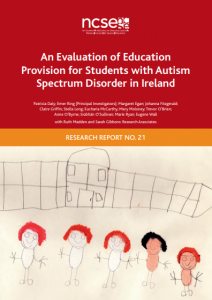 When a team of researchers at Mary Immaculate College in Limerick, conducted an evaluation of education provision for children with autism in Ireland from 3-18 years, they included children’s views about their schools and invited children to draw pictures, which communicated lots of interesting things to the researchers about how children were experiencing their schools. The drawing on the cover of the report is by a child with autism who drew his school and his friends. This helped the researchers to chat with the child about his school and find out if he was enjoying his school experience. This report is available to download free from the website of the National Council for Special Education. On this website you will also find a section ‘For Parents’ http://ncse.ie/ , which has lots of information, you will find useful as your child enrols in primary school or moves on to another stream in the school. Chatting with teachers and other staff during your visit to the school. Most importantly, remember that you know your own child best and that selecting a school for your child should be based on your knowledge of your child and the school in which they will thrive, flourish and be happiest.